The prolific animator Tim Allen recently visited Newport to do film surgery sessions and a talk. Tim's credits are as varied as they are extensive, from Disney's The Lion King to Tim Burton's Corpse Bride. He works predominantly in stop-motion and has worked on all sorts from commercials to series and features, most recently as a character animator on Wes Anderson's Fantastic Mr Fox. Tim joined us for a morning seminar where he went talked through our graduation films and gave excellent feedback on character performance, timing and readability of the images which was really useful at this stage. He had a great approach and genuinely seemed to care about the work and gave a really effective commentary on the films. 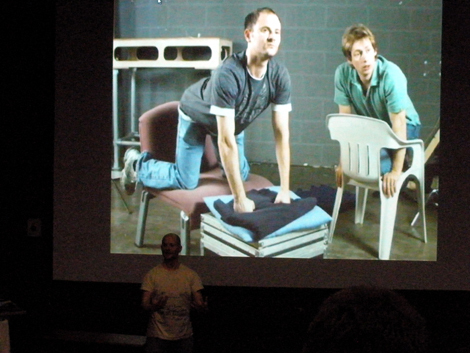 Later in the day he did a talk to a packed-out auditorium in the new city centre campus in Newport which included talking through various projects in detail; the practicalities of animating, the differences between shorts and features, problem solving, acting and performance. A really inspiring day with a brilliant animator and all round nice guy!